The image you see above integrates Reiki and Feng Shui principles to create an Antahkarana Altar. Lets take a closer look at the Master Reiki symbol called, Antahkarana, created by Reiki Master William Lee Rand. There are two Antahkarana symbols; yin and yang, but for now we'll explore the Yin (female) symbol. In essence, the Yin symbol promotes healing in a gentle way for both male and female energies. What's being healed and manifested will depend on your intentions. Traditionally, to make an Antahkarana altar, the ingredients include the image of the Antahkarana and 7 crystals, each one corresponding to the seven chakras. The twist of Feng Shui comes from including objects of your choosing that have positive meaning, besides the 7 crystals, to refine the presentation of your Antahkarana altar, especially if you are conducting a Space Clearing for clients. 1. Choose a ceremonial cloth. I chose to use my grandmother's hand sewed embroidered red velvet cloth as the ceremonial cloth, and placed it on-top of the Antahkarana. 2. Place the 7 crystals on-top of the ceremonial cloth in alignment with the Antahkarana edges. 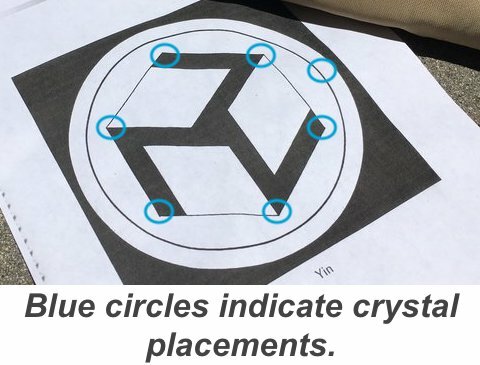 The diagram above illustrates the placement of the crystals. Six of the crystals are positioned along the six edges of the Antahkarana, which creates a Hexahedron. The last crystal, also referred to as the "master crystal," is then placed to the side of the six crystals. 2A. The image above illustrates what the altar looks like when the ceremonial cloth is placed over the Yin Antahkarana symbol with the crystals. 3. Think about why you are asking for help in transforming certain aspects of your life. Once you have your answer or answers, you could then choose an object, or write 3-8 intentions on a piece of paper placed inside a unsealed red envelope. Either the object and/or written intentions could then be placed inside the center of the Antahkarana altar. Referring to my altar as an example, I used a living plant, which for me represents self-growth, expansion of knowledge, and practicing being present with every step on my journey. Eventually, I'll pair it with written intentions. 4. One of the last objects on my altar is a blue bracelet. This was given to me by a friend and written on the bracelet is the name of all four elements; fire, earth, wind, and water. Ideally, when creating an altar, its recommended to use the real elements. 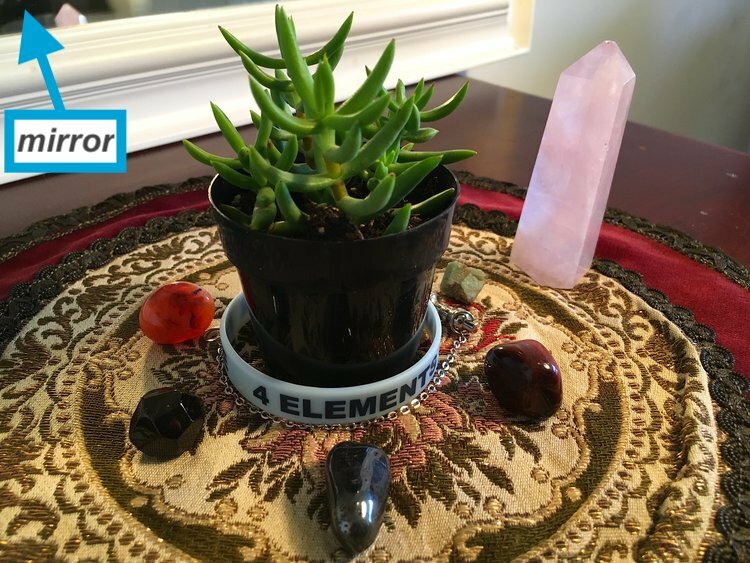 Yet, the intention of use for this blue bracelet becomes the metaphor for all four elements. So this means, the words (which also carry enegtic frequiencies) work just as good. 5. (optional) To further help amplify this Feng Shui Master Reiki Altar, you could place it in front of a mirror, as you see in the above image. In Feng Shui, mirrors are known to serve multiple purposes and in this case, the intention is to double the vortex of gentle healing and manifestation. 6. Where to place your altar? Ideally, its suggested to place an altar within a location of your home that will not be disturbed from heavy foot traffic. As for me, I keep my altar inside my office which is mid-way into my home and provides privacy. 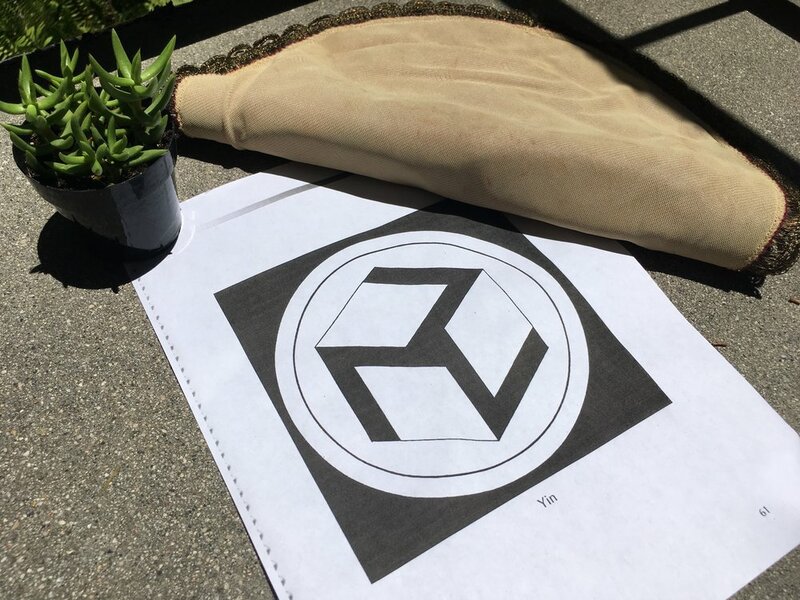 If you would like to print out your own version of this, here is the Yin (female Antahkarana symbol. Lately, I’ve been receiving multiple calls to provide Feng Shui Consultations with the purpose of selling homes. So getting right to it, here are five tips to help the process of selling move along. Is the home easy to spot from the street? This includes the house number on the house and mail box. Does it convey an inviting feeling? Is anything physically or visually blocking me from driving or walking to the house? Think simple outdoor front entrance displays; solar lights, flowers, welcome sign or mat as some basic go-to enhancements. Sometimes this can be challenging because there are emotional memories associated to the house. One way to offer a fair assessment is by hiring a Feng Shui consultant or working with atrusted friend who has not been to your home in a while. Either option will allow for an emotionally neutral critique of the house. So I invite you to put you defensives down and listen with an open heart and mind. Invest in some basic landscaping. This helps enhance the overall exterior presentation of your home. Be sure bushes are not blocking windows and trees branches are not impeding over the home. Any leaves or other debris are also suggested to be removed from covering the pathway leading to the front entrance. For those who live in a condo, focus on enhancing the main entrance. The addition of fresh cut flowers, have good lighting, fresh coat of paint, cleaned floors and carpet, beautiful neutral art; create a refreshed and open feeling. This is also a great and practical way to help ‘remove’ your energy from the home. Depersonalize. I tend to get resistance with this suggestion, yet its very powerful. If you are truly ready to move on, allow the home to become less personal and used. The purpose of being inside the house has now become a transitional point. Showcase the positional use of the home by opening up space in each room. Does this mean you need to hide oreverything? No. It’s simply saying not to overdo it with personal touches. You could have some family photos out, artwork (make sure its neutral; like with nature images, flowers, etc), and some real plants if possible. These accessories become quick navigational focal points to help the buyer’s eyes move evenly throughout the room. Enhance the “Energy Triangle.” This includes the kitchen, bathroom, and bedrooms. These are some of the most active zones in a home so by having the best presentation for each of these rooms is key. Be sure the kitchen is clean; add a bowl of fruit as a sign of abundance and fresh yellow flowers. Adopt the habit to make the beds and refine a balanced composition with all bedrooms. Approach the bathroom with a spa like presentation; keep the staging simple and smelling good. Let the outside in. Open the blinds and if the weather allows, crack open some windows around the home. The natural lights helps to ‘highlight’ the energy inside, while also lighting up the interior. Allowing some natural wind flow into the house reduces any ‘stuffy’ feeling and energetically calls in buyers. Release and Let Go. What you say and what you do needs to align. If your intention is sell, be sure the home and emotions reflect that. On an unconscious level, there are times where people who are selling still have an emotional and/or physical attachment to the home. This was the case for a recent client in Brooklyn, NY. Everyone in the family is ready to leave except for the daughter. She made her claim known by displaying her drawings, stuffed animals, and other personal trinkets. The areas she occupies are lived in vs packed and ready to go. This is a very sensitive experience, yet its important to keep an open heart and mind for what awaits just over the horizon. Conduct a space clearing. This is also referred to as ‘smudging.’ To do a simple space clearing, take some Native American White Sage and allow the smoke to permeate throughout the house. Start at the front door and move from room to room. If you have a basement, you could start in that section of the house and move up to each floor. In general, set the intention to sell your home, while also having a general or specific target of where you're moving to. Be honest with yourself; if you notice you have a lot of emotionally charged thoughts and feelings do not space clear. Instead, invite another trusted person to step in and perform the ceremony with you, meaning they could take the lead while you are still participating. This is a transcendental way of releasing your energetic imprint and emotions from the home and land.